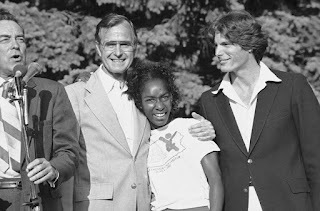 Back while filming Superman 1979 in London Christopher Reeve got to know about the Special Olympics GB (Great Britain) a program for mentally retarded individuals. That year, he served as a track and field coach at the Special Olympics, alongside O. J. Simpson. Special Olympics founder Eunice Kennedy Shriver asked Reeve to help with the TV commercial shoot. He fittingly wore a jersey with a Superman logo on it. 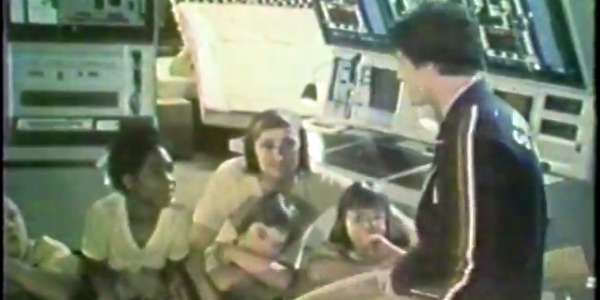 The Special Olympics GB athletes in the PSA are from Gloucester and this television commercial was filmed at Pinewood Studios around 1980 and shown on US TV in 1982. It's a heart-warming video as Reeve tenderly works with the young men and women to jump on a trampoline. A simple thing for many but deeply moving for them. The end where the young girl tenderly kisses Reeve is my favorite part. The team was so moved that the London premiere for Superman was also a fundraiser for Special Olympics GB. According to Caped Wonder on December 13, 1978, the "European Royal Charity Premiere was held in London at the Empire Leicester Square Theatre for the benefit of Variety Clubs of Great Britain and The National Association of Maternal and Child Welfare". Reeve was deeply moved by the Special Olympics and continued to advocate for the organization. He later met Vice President George Bush and the Special Olympics torchbearer Loretta Clairborne at a Special Olympics reception held on the White House grounds. "We attended three Special Olympics, and Christopher was incredible," Superman executive producer Ilya Salkind later recalled. He was just so natural and so warm. These children, they felt it, they felt the person." A screening for the premiere of Superman II on June 1st 1981, also benefited the Special Olympics. Reeves was an open and motivated advocate for many charities but the Special Olympics touched his life in an unexpected way. After a horse riding accident in 1995, he was paralyzed from the neck down. In 1996 served as master of ceremonies for the Paralympics games in Atlanta. "As we exit this stadium, consider their journeys and rejoice in their accomplishments," Reeve said on the platform. "They've arrived at a place in the world, the pinnacle of competition for world-class athletes with disabilities." In a promo for the 2004 Olympics, Reeves said, "Funny, isn't it. An athlete aspires to be the best his or her country has to offer and ends up representing the best humanity has to offer. That's the strength I find in the Olympic games." "Special Olympics GB is the largest provider of year-round, all ability, sports programme in Great Britain and supports over 10,000 athletes with intellectual disabilities on a continued basis. "Across, England, Scotland and Wales, approximately 27,000 regular sports coaching sessions of at least one hour each, are delivered locally each year by 140 accredited programmes across 28 different sports. "This coaching activity leads to an annual average of 100 all ability, inclusive sports competitions. Its competition pathways make Special Olympics Great Britain unique within the disability sports sector as it provides for athletes of all abilities, opportunities to compete and progress at local, regional, national and international levels. "This extensive programme is led by over 4,000 dedicated volunteers in a variety of sports coaching, administrative, event, logistic, fundraising and supporting roles. "For our athletes, excellence is personal achievement, a reflection of reaching one’s maximum potential – it is a goal to which everyone can aspire. For those Special Olympics athletes who attain an elite level in their sport, we signpost and support a pathway into Paralympics and other elite competitions." Reeve and his wife later formed their own charity called the Christopher and Dana Reeve Foundation "dedicated to finding treatments and cures for paralysis caused by spinal cord injury and other neurological disorders". Christopher Reeve was an amazing man on and off the screen and it's still heart-warming to see the way he fought for others with and without his cape. What do you think about the commercial for the Special Olympics? Let us know in the comments below!